High Resolution Files + Social Media Files + Private password protected online gallery to give to family and friends to see all of your wedding photos and download as they please. *Additional costs may apply when significant travel is required and/ or accommodation is needed for example: Destination Weddings or interstate. Also please inquire about a second photographer if the guest number exceeds 130. All wedding packages include a pre wedding couples shoot (30min to an hour shoot at a location of your choice) and all of the images edited and delivered on a cute mini camera USB drive. This photo shoot gives you the opportunity to get a little bit more comfortable in front of the camera. It also gives us a chance to get to know you and in return you will have a chance to get to know your photographer before your wedding day. This will make it a lot more comfortable for both of us on the day of your wedding and we can have a bit of fun! There is no pressure on the couples shoot. It is just a bit of fun and a nice chance to get even more beautiful photos together with your loved one! Locations are flexible (within a reasonable distance) and we are more than happy to cater towards your style and personality. There are NO hidden charges EVER in any of our photography packages. If there’s something that I really will have to charge you for I’ll let you know beforehand! 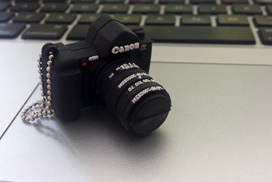 These cute little things are the Wedding USBs! 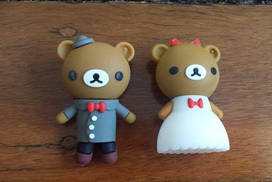 The bride bear has your Hi res images & the groom has the Lo res. 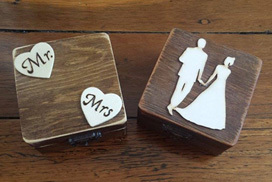 Your wedding USBs will need a little home to live in, so these are the wedding box. You will get to choose one box from the two styles shown above. They are hand crafted wooden boxes.